Tumbled Green Calcite healing gemstone with a nice sheen. Also found in rough crystals here. Green Calcite aids our self-discovery and in accepting ourselves and others as we are. These are a medium size in that most are 3/4" (with some larger or longer). Most are a pale minty green with some that go to a more olive green shade. Green Calcite has a trigonal cystal system and is in the mineral class of carbonate. It is formed from solutions containing calcium through sedimentation. Its lovely emerald green coloring comes from chlorite that has been trapped in the mix while it has crystallized. Generally, the Chlorite has been "well stirred" into the mix and is not predominate as in chlorite in Quartz. The beautiful, emerald green shades are found in Canada and Australia. To an unfamiliar eye, it can be mistaken for green Fluorite. But unlike Flourite's hard and shiney finish, Green Calcite, as in most Calcites, has a lustery, appearing almost wet, look. 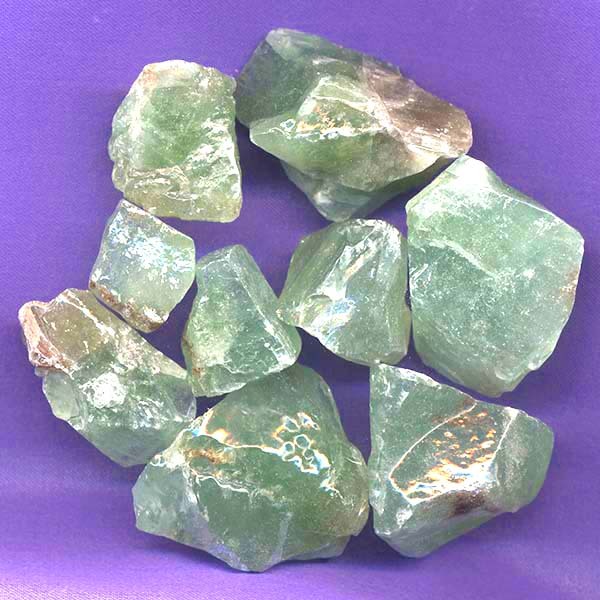 As with most gemstones, Green Calcite is best used when held or laid upon the body. When laid upon the chest or heart area it provides vitality and a feeling of security. Green Calcite aids our self-discovery and accepting ourselves and others as we are. Green Calcite enables us to reach out for help in the release of emotional grief in relationships, especially from childhood traumas. It can also assist, when appropriate, in forgiveness in relationship problems and can provide a release from emotional codependancy. Green Calcite provides balance and self-acceptance. It aids in recovering from divorce, death of a loved one and situations of conditional love. It will also help in transitioning from a negative situation to a positive, more fulfilling one. Green Calcite can aid in reducing high blood pressure, recovering from a heart attack, and to rid the body of infections. A good crystal for children adjusting to the challenge of education in a standardized setting. A great aid to athletes, aiding bones and joints that can be stressed during practice or competition. 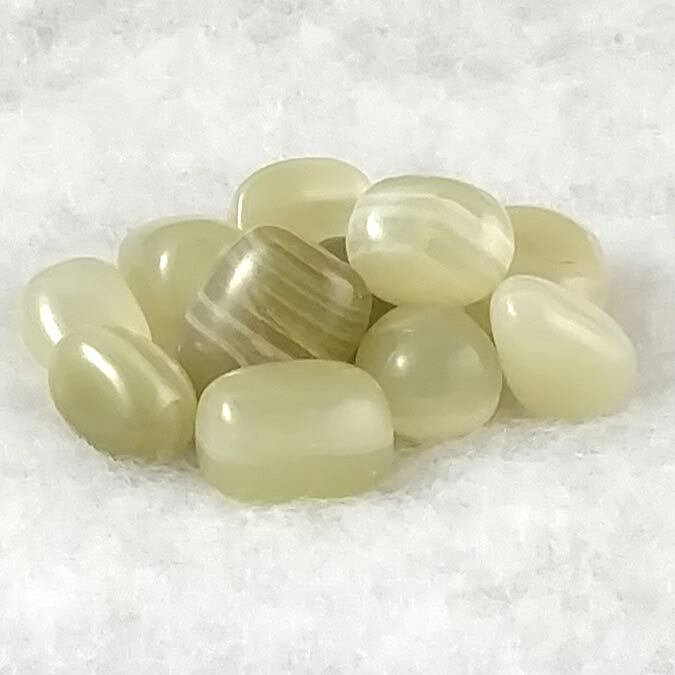 Green Calcite has a special affinity with Taurus but benefits all signs. It has a Receptive Energy, its Planet is Venus and its Element is Earth. Green Calcite, like many green stones may be used in prosperity spells. It is said to draw money and prosperity to the household, especially when a piece is set out surrounded by five flaming green candles each morning for a week.